Solid Deck Stain vs Transparent Stain: Which is Best for Your Home? Learn the differences between solid vs transparent stain to help you choose the right finish and protection for your deck. A well-maintained wood deck can transform the appearance of your outdoor living space. But even if you follow proper wood deck maintenance procedures, wood can still fade and look outdated over time. While you probably already know that you should be protecting your deck from inclement weather with a new coat of deck stain from time to time, you may not know which choice is best for your home. The following factors should be taken into consideration before deciding between solid deck stain and transparent stain. While both solid and transparent deck stain can be made of similar ingredients including pigments, transparent stain is much thinner than solid stain. Transparent stains are made to soak into the wood surface you’re finishing, whereas solid stains simply sit on wood surfaces and produce a thin film for protection. Wide variety of stain color options. One of the many advantages of solid stain is that it gives homeowners a plethora of color options to choose from. This can be helpful if you want your deck to pop with color, or simply desire to give your deck a more contemporary look. Solid stain can also cover up previous colors which can be an attractive benefit for many homeowners. Masks imperfections. If you want to hide small imperfections and blemishes on your deck, solid can be a great option. Because solid is thicker than transparent, it can mask minor damage on wood and fill in any grooves or spots that you want to hide. This can be especially helpful if you have replaced some wood boards and they don’t match your original boards completely. Can be easy to clean. Solid decks can often be easy to clean. Darker colors are typically easier to clean and maintain, while lighter colors may show more wear and tear. The slick surface of solid stain allows you to easily sweep away dirt and debris. Moisture-resistant. Solid stain can provide your deck with a solid coating which can protect the wood from moisture damage from rain, snow, and other precipitation. Blocks UV rays. Using latex solid deck stain with UV-blocking pigments can protect your wood deck against inevitable sun-related fading. Can sometimes be applied over paint. In some instances, solid stain can be applied to a deck that has been painted. Once you use a solid stain, it’s nearly impossible to go back to transparent stain. After applying solid stain to your deck, it will be nearly impossible to go back to the natural appearance of transparent stain. Check out the finishes on your friends’ and neighbors’ decks to gauge how you feel about solid and transparent stains before committing to solid. Hides natural grains of the wood. Often, the beauty of decks is their natural wood characteristics. When solid stain is used on a deck, the stain will completely cover the wood grain. Will crack, peel, and blister. While solid stain can resist fading from the sun, it won’t resist eventual cracking, peeling, or blistering. This is especially true if the wood is often wet or in direct sunlight. No matter how good the solid stain or the painter, solid stain will eventually peel and need recoated. When Should You Solid Stain Your Deck? There are many good reasons to solid stain your deck. If you are looking to refresh your deck with a new color, want your deck to match your house trim, or simply want to maintain its color, solid staining your deck could be right for you. Solid stain can last up to 10 years in protected areas. In wet, sun-drenched, and heavy foot traffic areas, your solid stained deck will need a recoat every year. Offers a natural look. Transparent stain can help you maintain your deck’s natural coloring and make it easy for the wood grain to show through. If you want a more natural, rustic look, a transparent stain will give you just enough color, or a clear coat will allow the natural wood color to show through even more. Protects wood from weather damage. Semi-transparent, semi-opaque and sealers can all help protect wood from sun and seasonal weather changes. Keep in mind that professional painters should be called on to re-stain your deck floor every 1 to 3 years, and railings and vertical surfaces every 8 years to ensure the wood is properly protected from the elements and general wear and tear. Horizontal surfaces take much more weathering than vertical surfaces, so the floor will fade faster than hand rails. UV protection. The darker the stain you use, the more it can help your wood deck resist fading from UV rays. All transparent stains and sealers can effectively protect your deck from sun damage, but a solid stain won’t have to be reapplied as often. Moisture-resistant. Staining your deck with any stain or sealant will protect the wood from rot and fungus. Doesn’t get too slippery. Because stain penetrates the wood, it is less slippery than solid stain. Economical to maintain. If you’re looking for an economical finishing option, transparent staining your deck can be an ideal solution. Stains soak into wood rather than forming a layer of film on top of wood. This can be helpful if you desire a deck surface that resists cracking, peeling, and blistering from foot traffic and general wear. You will see imperfections. Transparent deck stain does not cover wood imperfections at all. Transparent decks can be stained over with solid stain. Even if you have stained your deck with transparent stain for many years, you can easily use a solid stain later if you want a different look. Limited colors available. Transparent deck stains are limited to around 60 shades, but solid deck stains will offer over 3,000 choices. Choose the right stain for optimal protection. Before deciding on a paint stain, keep in mind that the more pigmented or opaque the stain, the more resistant it will be to seasonal weather changes and moisture. If you like the look of more transparent stains, you will need to re-stain your deck sooner than you would if you went with a more solid stain. Can’t be applied over painted surfaces. Unfortunately, transparent stain can’t be applied on a deck that contains paint unless the paint is professionally stripped off beforehand. Can’t hide major imperfections without repairing first. If you need to hide some bigger imperfections on your wood deck, stain won’t be able to do the job. In fact, it will enhance large chips and cracks instead! If you want to stain your deck, fix wood damage using professional wood repair services before staining. When Should You Use Transparent Stain on Your Deck? There are many good reasons to stain your deck using transparent stain. If you like the look of natural wood decks, are planning to sell your house, or want an economical finish, staining your deck with transparent stain could be right for you. Also, if the wood looks dry and is splintering or cracking, this is a good indication that it’s time to recoat your deck with transparent stain. Sweeping your deck of any wet leaves, pollen, dirt, and other debris. Power washing or hosing down and scrubbing the deck to remove mildew. Inspecting your deck and fixing wood damage every season. Having professional painters re-stain your deck when it shows signs of fading and wear. Is it time to stain your deck? Deck staining professionals will do all the hard work for you by preparing, cleaning, and finishing your deck properly. Professional painters are highly skilled and use the right products, tools, and procedures to give your deck a beautiful finish that lasts. Get a free quote today! Get a quick, computer-generated commercial painting or house painting quote at no cost to you. 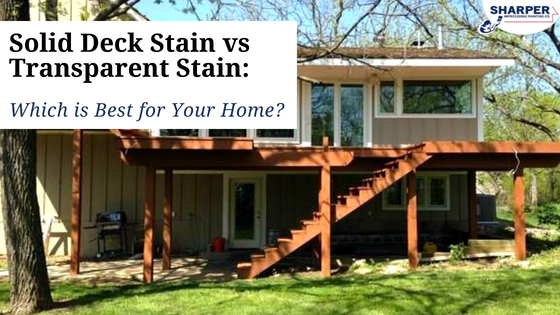 Home » Recent Projects » Solid Deck Stain vs Transparent Stain: Which is Best for Your Home? © 2019 Sharper Impressions Painting - All Rights Reserved.